'It's A Very Different World Now,' Says Outgoing Human Rights Commissioner : Parallels Nils Muiznieks has worked with the Council of Europe for the last six years. He shares his thoughts on the state of human rights, cultural racism, and the threat of war, genocide, and dictatorship. 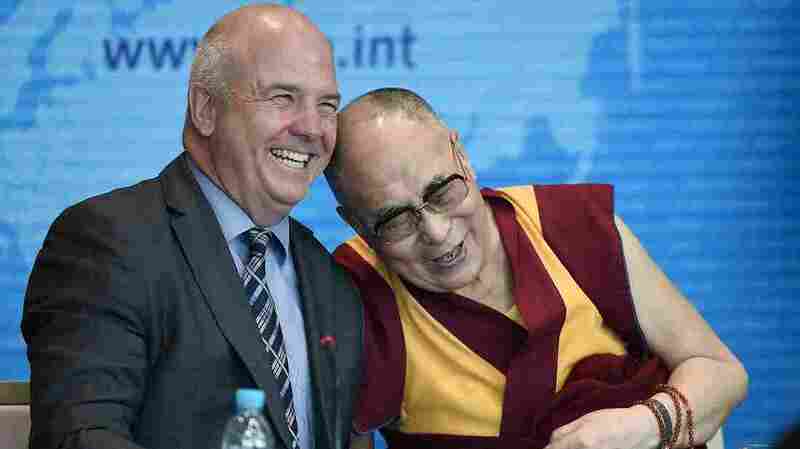 Outgoing European human rights Commissioner Nils Muiznieks (L) shares a joke with the Dalai Lama at the Council of Europe in Strasbourg, France, in 2016. "My mandate was marked by a whole succession of crises," Muiznieks tells NPR. "The economic crisis and the fallout that had on human rights, the Ukraine crisis and the tensions and suffering that that created, the migration policy crisis, which fueled a lot of racism and nationalism within Europe and undermined European solidarity, and a whole string of terrorist attacks and very problematic responses on the parts of governments." He says those crises developed along with backsliding on a range of human rights issues. Muiznieks' own parents were refugees. They left Latvia during World War II and lived in displaced persons camps for years, eventually coming to the United States. As responses have hardened against migrants, he says he has spotted parallels between the U.S. and Europe: "For example, on migration, discriminating against certain groups, building walls, deporting people. This narrative already existed in Europe, but what's been going on in the last year and a half has reinforced that trend in Europe and globally — the building of walls and trying to keep people out," he says. One reason is generational change. The system was created to basically prevent war, genocide, and dictatorship. The people in power now aren't so afraid of war, dictatorship, and genocide. They're afraid of other things, and the public is as well, [including] terrorism, migration, economic insecurity. People are in the illusion that war, genocide, and dictatorship cannot happen again. But my own view is that democracies are quite fragile and that war, especially in some areas of Europe, is never far away. Most people in Europe don't think that way. I think another reason is you've had these attacks on human rights by populists, by the tabloid media, that human rights is the smug jargon of liberal elites who are disconnected from the masses. And they very successfully distort what human rights means. They often claim that human rights have been captured by specific unpopular groups — by gays, by migrants, by various marginalized or vulnerable groups in society. And then, the majority doesn't see how human rights belong to them or are relevant to their concerns. ... Human rights are being attacked, and we have to fight back. In the Western Balkans, in the area of ex-Yugoslavia, this region is more fragile than it was six, seven years ago. Nationalism and revisionism is on the rise. You have the glorification of war criminals in several countries. And you have very little learning from the past — very little reconciliation that is taking place there. You have an ongoing conflict in Ukraine, you have countries that are seriously backsliding. So war and the threat of bloodshed is still very much alive in many countries in Europe. Racism now is a very different beast than it used to be. It used to be biological and it used to be hierarchical. Now, what we see is a cultural racism that says, "We're not better or worse. We're just so different that we can't live together. We should live separately, go to school separately." And we see it against migrants — we see it against Muslims in particular in Europe. The targets are ever-changing, but I think the same animus is there. I've thought about that a lot. I don't think they do, actually. I think it's much harder to be a refugee [today than it was after World War II in America] because you're accused of being an economic migrant looking for a better life whose going to bring in all of your family members and you should stay where you came from. The key thing for refugee integration and for the success of the policy is economic growth and economic opportunity. And if economies are stagnant then people are afraid. My parents were quite fortunate. They did quite well for themselves. And I think it's a very different world now. The biggest crisis I confronted throughout my mandate was the migration policy crisis. I just struggled to keep human rights on the agenda, and as part of the frame of discussion about migration, asylum and refugees. This was the area where countries were most tempted to cut corners on human rights. Selena Simmons-Duffin, Lauren Hodges, and Renita Jablonski produced and edited the audio story. Sydnee Monday adapted it for the Web.